It is hard to resist the magical charm of this Emerald Isle where so many Americans have ancestral roots. Equestrian traditions are very much alive here and the Irish greet their American guests with friendly warmth. We have a broad choice of rides and it is an ideal place to begin your overseas riding adventures. 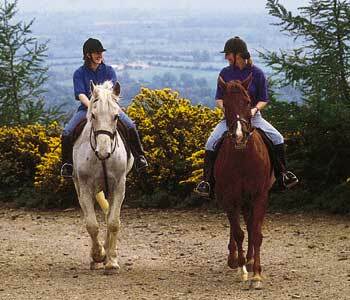 This flexible riding program is located in a picturesque corner of Ireland. The immaculate stable has well-mannered horses and a great variety of rides along the beaches and into the interior. The lovely little port town of Dingle is a favorite destination for sailboats whose owners are lured by the town’s restaurants, nightclubs, boutiques and art galleries. It is a great choice for non-riding companions, because the town and surrounding area have much appeal for a broad range of activities. This ride is based at Dunfanaghy, a typical coastal village in the remote northwest of Ireland, which has some fabulous unpopulated beaches for glorious gallops on willing Irish hunters and Connemaras. The congenial hotel, with its Irish pub and excellent cuisine, provides an ideal base for rides in the wild surrounding area. There are many chances for contacts with local people and riders follow some of the roads built during the time of the Great Famine, which is still much alive in memories here. Ride cross-country with opportunities to jump a variety of natural and man made obstacles. The horses are all excellent hunters experienced following hounds with the Galway Blazers. During hunting season you may, if you wish, hunt up to three times during the week. The trail’s varied terrain includes the Slieve Aughty Mountains, large tracts of forestry, rolling hills and green fields set off by a latticework of lacy stone walls, and small country roads. Please call for further details on the other adventurous rides, the Connemara and Coastal Trails, run by the same outfitter during the summer months. The Markree Castle Trail offers a week in the luxury of this grand old castle and a four star hotel in town. The castle gives you the feel of how enjoyable and gracious life was for the Irish aristocrats in good times. While at the attractive new hotel in the heart of town you will have easy access to interesting shops and nightlife. This is the part of Ireland immortalized by the writings of the poet, W.B. Yates. It is a wonderful opportunity to fulfill your riding desires in mountains, valleys, pine forests and on the beaches of this romantic island. The itinerary is flexible and there will be an opportu-nity to visit a crystal factory and places of historical interest. An unguided ride for experienced and resourceful horse people who are prepared to take all responsibility for themselves and their mounts for a week. One stays in a different local farmhouse or bed and breakfast each night, where the horses overnight as well. Maps are provided and the routes are marked, but it can still take skill to find the right trail. 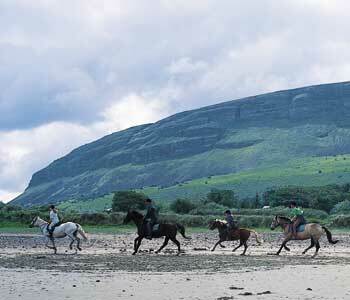 The route takes in a variety of the beautiful country around Sligo which was so loved by the great Irish poet, W.B. Yeats. There are woods and hills, beaches and dunes, farmland and peat bogs as well as quaint villages with their pubs and shops. It is a wonderful opportunity to discover Ireland on your own. Coastal Trail - A fairly fast riding tour which often has many participants. A considerable part of the route is along Ireland's glorious beaches and dramatic coast line.